Tony Hunt spent the six decades of his professional and personal life interacting with the élite in the fields of engineering, architecture and industrial design – this is his story. His life and career are described, showing how he formed lasting relationships with architects, patrons, artists, photographers, industrial designers, writers, critics and with his own staff. Connexions demonstrates the way in which he was able to adapt his engineering solutions in collaboration with architects in the formative stages of the design process to find structural solutions sympathetic to their architectural aspirations. It examines the quest for technological advance and Hunt’s passion for industrial and product design which led him to favour an industrialized component-based approach to engineering in architecture. He showed an unerring ability to identify and express key components within a design, concentrating on the way they connected together, and demonstrated a practical knowledge and experience of the technology required for their manufacture. The results of Hunt's contribution, and the many prestigious commissions he received, when working with the generation of acclaimed architects emerging from the Architectural Association, the Royal College of Art and from Yale University scholarships in the early period of his career, are well-documented and publicised. Direct comparisons with the great European and American architect engineers such as Richard Buckminster Fuller, Charles Eames, Fritz Haller and Jean Prouvé are justifiably made. 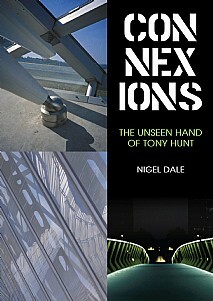 Connexions also concentrates on the personal and professional relationships that Hunt formed during his career and, by reference to past and contemporary architects, engineers, industrial designers, artists, etc., the place that Tony Hunt occupies in the history of UK design. This revealing book will be of immense interest to all architects, engineers, lecturers and students in all schools of architecture and engineering.